1.5 HP Hi-torque Baldor Motor. 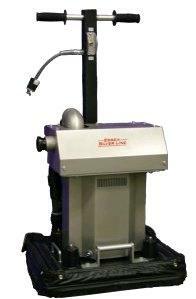 Heavy Duty Vacuum System for superior dust collection. Self-Leveling Skirt With Crimped Nylon Bristles. Hi Impact Polyurethane Dust collectors located on the sides & rear of machine. * Please call us with any questions you may have about our sander orbitec with dust bag in Kingsport TN, Johnson City, Elizabethton, Rogersville TN, Gate City VA and the NE Tennessee, SE Kentucky and SW Virginia Tri-State Area.